The exhibition was held in the Rare Books Exhibition space, Sir Louis Matheson Library, Monash University from 17 June - 20 August 1999. This exhibition includes works from the 16th to the early 20th century, from Marco Polo to "Chinese" Morrison. There are 17th and 18th century maps as well as photographic albums from the 1890s. The "Far-East" includes the area from India to China and Japan. 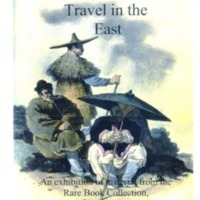 This exhibition includes tales from less-famous as well as well-known travellers.